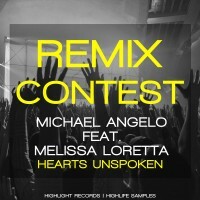 We are very excited to announce the remix contest of the track “Hearts Unspoken – Michael Angelo feat. Melissa Loretta”. Download the remix pack and participate with your own remix entry. The name of this contest is Michael Angelo feat. Melissa Loretta – Hearts Unspoken Remix Contest (“Contest”). The participating label for the Contest is HighLight Records. All entries must be sent via email to info [at] highlight-records.net with a private soundcloud link of the remix between February 22, 2016 and April 22, 2016 by 11:59 PM MT. Public soundcloud links of the remix tracks are not allowed. Remixes found to be public will be removeded from the remix contest. All winners will not have any extra royalties from the track release.